Hollywood, for reasons best discussed elsewhere, has followed modern literature in creating stories that revolve around structure and familiar constructs. Most films today can be understood in terms of various conventional lenses; character, plot, setting, theme and so on. All of these are applicable to Birdman (Or The Unexpected Virtue of Ignorance) but in examining director Alejandro Gonzalez’ masterpiece through such devices, it is all too easy to miss the immediacy of the film; the raw intensity of the emotions emanating from the characters is something that is better experienced than analysed. Michael Keaton is the lynchpin of this year’s Oscar darling, playing the washed up Riggan Thomson, an actor trying desperately to put together a Broadway production in order to create ‘real’ art but unsure what that entails exactly. Supported by virtuoso performances from Ed Norton and Emma Stone, the deeply flawed and troubled characters explore the thin, invisible boundary that separates the stage from reality. Indeed, a large part of the movie’s perpetual dreamlike atmosphere comes from the frequency with which it crosses that boundary. A huge chunk of the movie is filmed in a single shot and while in the beginning it is relatively simple to tell when the characters are performing on stage and when they are not, by the movie’s end, the tensions of the stage have thoroughly infected the characters’ lives and stage and reality begin to blend and mirror each other. With each character fighting to overcome their own demons as well as each others’, there is absolutely no shortage of conflict, but Birdman is less concerned with the outcome than it is with presenting the incredible, pressing urgency of these conflicts and the characters’ responses to them. One leaves the theatre wondering if the characters are doomed to be flawed forever before wondering next if that even matters at all. With such high-handed, abstract concepts being thrown around, it is crucial that the film be almost flawless in its execution. It helps then, that Michael Keaton, previously best known for being the best Batman pre-Christian Bale, knows Riggan Thomson very well. How could he not? He’s as close to being Riggan Thomson as can be. Even with that in mind, his performance is nothing short of astounding. He is the very core of the film’s (black) comedic soul; one moment he’s running on stage barely clothed, the next he’s ranting and raving savagely about the injustices of the world. From the giddy heights of elation to the heart-breaking depths of despondency, from narcissistic but driven to aimless and lonely, the character’s every emotion is exaggerated and taken to its extreme, regardless of whether the character is on stage or not. Where Thomson is a livewire both on stage and off, Ed Norton’s character, Mike, only comes alive on stage while barely functioning off it. Norton plays off his own reputation for interfering with producers and directors and plays off Keaton’s own extravagance well. The duo is rounded off by the confused cynicism of Thomson’s daughter Sam (Emma Stone). Stone captures Sam’s jadedness well; she is the quintessential generation Y teen, weathered before her time but generally a good person at heart. A final, somewhat surprising, mention should go Zach Galifianakis, who seems to have recovered from his hangovers enough to deliver a solid performance. His character, Jake, doesn’t get as many chances as the others’ to strut his stuff but Galifianakis makes the most of what was offered. It might be a little early to call the film a tour de force but it’s certainly not for nothing that the film has critics raving and has received the Academy’s highest honour. Fans of film history might see some resemblance in the film to the works of Jean-Luc Godard but there is plenty for the less esoterically minded to enjoy as well; there are endless conversations to be had about not just the film’s primary themes (and good luck finding a consensus on what those are) but also its less emphasized secondary themes. Briefly, we explore the role of the critic in modern art as well as the artist’s increasingly impossible urge to captivate a world that is spoiled for choice. 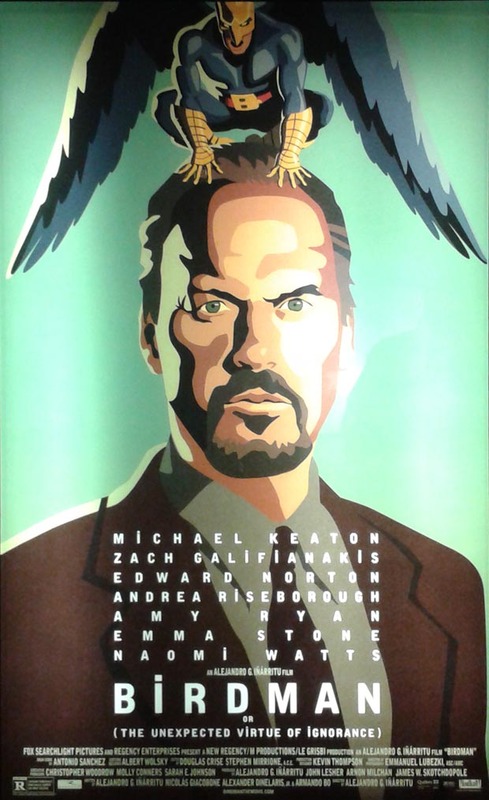 Birdman (Or The Unexpected Virtue of Ignorance) is ultimately a commentary on exhausting, often unacknowledged, difficulty of creating any form; your best efforts might be panned and ignored while your accidents might be hailed as the touches of a maestro.